The Christie M Series line of 3DLP projectors include enhanced performance, portrait capabilities and a 500 hour increase in the 450W lamp. The updated Christie M Series models are made for flat or curved screens in rental staging applications as well as large auditoriums, board and conference rooms, houses of worship, and post production in either single or multiple projector setups. All enhanced Christie M Series 3DLP projectors are 3D upgradable for large screens. Rental staging and permanent installation applications will benefit from the improved high-efficiency 450W dual-mercury lamp with 1,750 hours of usage before a lamp change. 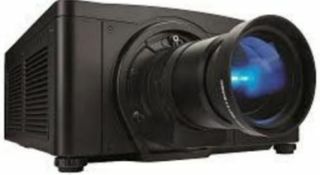 Eighteen Christie M Series projectors are now portrait capable. Extended life on 450W lamp models. Dual input DisplayPort module allows for greater digital connectivity on the product when shipped. Dual mercury lamp operational in single lamp mode for built-in redundancy. Hot swappable lamps can be changed while projectors are in use. 3D capabilities operate in either active or passive stereoscopic modes in the Mirage models, and include triple flash capability for smooth images when displaying Blu-ray content. Embedded Christie Twist image warping and blending, and optional Christie AutoStack software to align Christie projectors in minutes. Multi-window processing for small tiled and blended arrays means no external processors. Patented embedded LiteLOC technology monitors and manages brightness levels. The Christie M Series is now shipping with a three-year parts and labor warranty.